Camshaft alignment tool – No.T40094. Camshaft holding tool – No.T40095. Crankshaft locking pin – No.3242. High-pressure fuel pump belt camshaft sprocket holding tool – No.3036. High-pressure fuel pump belt camshaft sprocket puller – No.T10320. Two-piece gear alignment tool – No.T40096. Do NOT turn crankshaft via camshaft or other gears. Do NOT turn crankshaft or camshaft with timing gear(s) removed. Removal of high-pressure fuel pump belt. Removal of high-pressure fuel pump belt camshaft sprocket. Engine at TDC on No.1 cylinder. Remove blanking plug from sump  . Install crankshaft locking pin  . Fit exhaust camshaft on camshaft alignment tool  . Ensure camshaft alignment tool engages in end of camshaft  . Align gear teeth of two-piece exhaust camshaft gear with camshaft gear alignment tool  . Fit inlet camshaft on camshaft alignment tool  . Move exhaust camshaft in direction of arrow to engage teeth of camshaft gears  . Fit camshaft housing on camshafts  . Retain camshafts in position with camshaft holding tool  . Disengage camshaft alignment tool from end of camshaft  . Remove camshaft housing and camshafts held in position with special tools from camshaft alignment tool. Place camshaft housing with camshafts and special tools on cylinder head  . 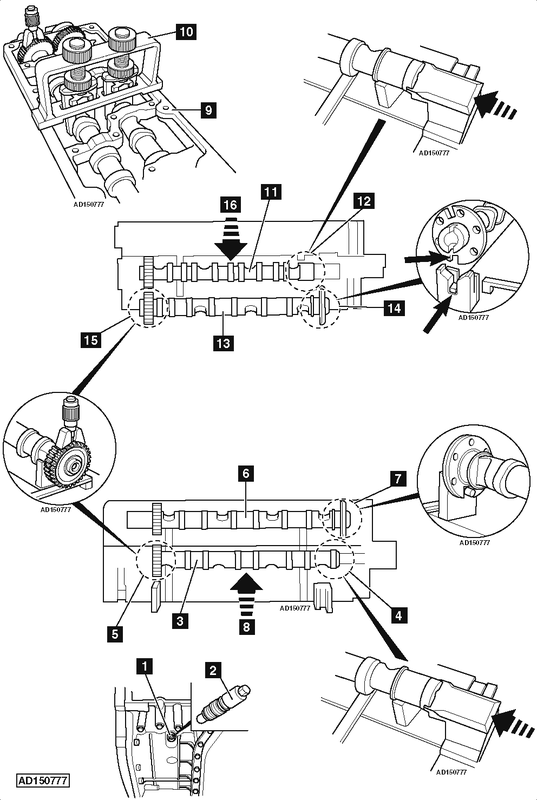 Ensure crankshaft locking pin located correctly  . Remove special tools  &  . Align gear teeth of two-piece inlet camshaft gear with camshaft gear alignment tool  .